Waterways provide many ecological and socialservices, such as water supply, navigation,freshwater reservoirs for aquatic organisms,recreation, and fisheries. However, in heavilydeveloped waterways, the diversity andproductivity of fish assemblages typicallybecome reduced, mainly due to migrationbarriers, pollution, habitat loss, and biotopesimplification. Additionally, navigation maydirectly or indirectly reduce fish assemblages,amplifying the effects of habitat destruction.This study summarizes navigation impacts toimprove the evaluation of direct navigationeffects on fish assemblages. Literature onhydraulic forces created by moving tows wasreviewed to compare the pressures induced byshipping with the biological capabilities offish, especially with their swimming speeds.Available studies of swimming performance offreshwater fishes were compiled to developgeneral models of length-specific burst, aswell as critical swimming speeds. Modelsregressing total length on burst and criticalswimming speeds were highly significant.Linking applied hydrology and hydraulicengineering with fish ecology and physiology,absolute speed was concluded to be the bestpredictor for thresholds and limitations ofhabitat use by fish. A navigation-inducedhabitat bottleneck hypothesis (NBH) wasinferred from the threshold flow velocity,determining habitat availability for fish.According to the NBH presented here, swimmingperformance of juvenile freshwater fish is themajor bottleneck for fish recruitment inwaterways, as a result of their inability towithstand bank-directed navigation-inducedphysical forces. In essence, under commonnavigation conditions, with respect to inlandwaterway morphology, channel cross section,vessel speeds, and dimensions of commercialvessels, the navigation-induced return currentsalong the shore are usually around 0.8 ms−1 (0.7–1.0 m s−1) accompanied by a0.1–0.3 m drawdown. Under such conditions, theproposed threshold for small fish survival wasestimated to be 147 mm total length at criticalswimming performance (>20 s – 60 min withoutfatigue) and 47 mm at burst performance (<20s). 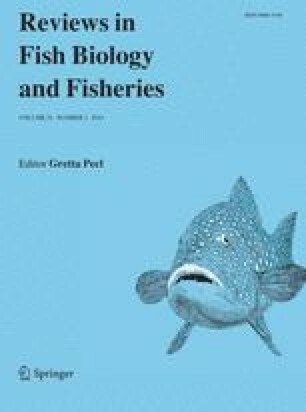 These theoretical findings were supportedby empirical studies of fish recruitment inwaterways. The strong dependence of fishrecruitment on hydraulic forces opens uppossibilities of formulating suitable criteriafor safe ship operation (speed and distance tobank), as well as for effective fairwaymanagement (construction and maintenance) andsustainable fish conservation (species andproduction). A more ecologically orientatedhydraulic engineering will not constraincommercial navigation and their socioeconomicbenefits, but it will substantially enhancefish recruitment in waterways and theirecological sustainability, for the overallbenefit of fish, fisheries, and society.